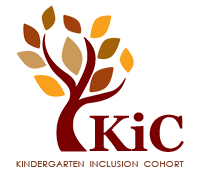 Our organization has always benefited from the energy and creativity of youth. We’ve never been about only feel-good, inspirational messages—we dig into the dirty work of creating real social change. A big part of that work is nurturing the leadership of the kids growing up in our community, with and without disabilities. Through programs like Dreambuilders and Think College Inclusion Oregon, we enable younger generations to have high expectations for their lives, and support the belief that they have real rights and a voice to lead. 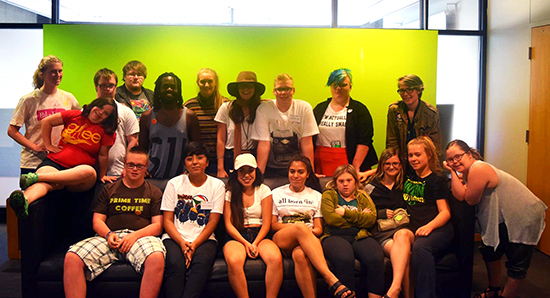 Our new Social Justice Youth Program is an innovative collaboration of young adults, with and without disabilities, and leadership mentors within the community focusing on social change. In late August, we hosted an all-inclusive, weekend-long summer camp for fourteen young adults, half of whom experienced disability. Campers came from different backgrounds and varying racial and gender identities. For two and a half days, they were immersed in interactive art and media workshops led by artists, mentors, activists, and advocates from within the All Born (in) community and beyond. Campers stayed in dorms at PSU and spent the weekend discussing social issues ranging from racism to equity, LGBTQ rights, immigration, animal rights, climate change, poverty and homelessness, and much more. Campers recognized that all of their peers face challenges, and they explored visual art, music, social media, and dance as modes of expression. The Camp was the result of the work of Austin Nugent and Rachel Esteve, Camp Co-Directors and NWDSA/ABI staff members, under the leadership and youth development experience of NWDSA/ABI Executive Director Angela Jarvis-Holland. A small grant from the Northwest Health Foundation and the Alan Jarvis Memorial Fund helped make the camp possible. Austin described the connections formed among campers as “magical and powerful”—the weekend started with 14 diverse individuals, and by Sunday afternoon they were one group united by determination to advocate for social equity. Most of the campers would not have otherwise had the opportunity to connect with individuals outside of their geographic location, socioeconomic status and/or social groups. As the weekend drew to a close and campers posed for a group photo, Rachel felt “empowered and connected” to the group.